Digital payments giant PayPal (an eBay company) recently announced that it would accept bitcoin, making digital-currency transactions accessible to merchants that sell digital products, such as downloadable music. Mobile payments platform Braintree, a more recent eBay acquisition, is also pending bitcoin-readiness. And eBay’s forays into the bitcoin payments space come on the heels of other major online retailers’ announcements to accept bitcoin as payment: Target, Amazon and Overstock. The larger players may be warming to bitcoin—but what about small to midsize businesses (SMBs)? To gauge whether their companies were ready to accept and perform accounting for digital currency, we surveyed SMB accountants and bookkeepers. And to explore whether the public was ready for wider circulation of digital currency, we surveyed U.S. consumers, asking about their current digital payment practices and their likelihood to use digital currency if it becomes more broadly accepted. Finally, we talked to a spokesperson from PayPal to get the company’s perspective. We also interviewed Ryan Lazanis, CPA, head of an accounting firm (Xen Accounting) that accepts payments in bitcoin, as well as Steven Lord, editor-in-chief of Modern Money Letter, who researches bitcoin and was an early investor. Their insights are integrated into the findings below. Twenty-five percent of consumers were likely to use digital currency if it becomes widely accepted, with 9 percent saying they currently use it. Of SMB representatives surveyed, half said they were ill-prepared for digital payments, and half were “not at all prepared” for digital currency. The majority of small businesses (55 percent) were not confident their accounting software could accommodate integration with digital currency. When we asked consumers which digital payment methods they were currently using, the majority (55 percent) were not using any of the services we listed. 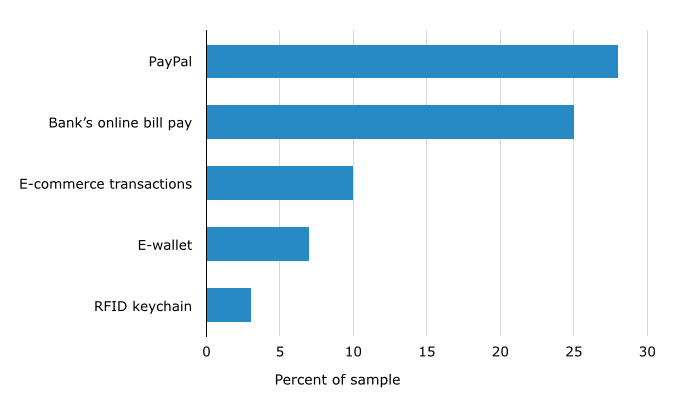 Among those who were using digital payment services, however, most used PayPal (cited by 28 percent of respondents). In comparison, 25 percent used online bill pay through their bank. Thus, our research suggests that the use of alternative digital payment providers such as PayPal is on par with—and may be exceeding—the use of traditional banks for online transactions. A number of respondents were using other digital payment methods: 10 percent made payments through ecommerce sites, such as Amazon, and a smaller number (7 percent) used e-wallet technologies, such as Google Wallet or MasterCard Paypass. Less than 3 percent used radio-frequency identification (RFID) keychain technologies. Digital payments and digital currency are both disruptive technologies, but they have different roles in the payment ecosystem. “Digital payments” are Web and mobile applications for online transactions—which, until recently, have depended on traditional banking and credit agencies at the back end of the payment. “Digital currency,” on the other hand, is a complete alternative to traditional money: Units can be exchanged peer-to-peer, without any government, banking or credit organization backing or brokering the exchange. Digital currencies have commonly been associated with underworld Internet economies, where drugs and illicit services are sold (i.e., the “Dark Web”). It is only recently that major brands have begun accepting bitcoin payments, and that governments have begun proposing regulations (such as the New York Department of Financial Services’ ongoing discussion of U.S. regulation). But would consumers use digital currencies if they were more widely circulated? When respondents were asked about their likelihood to use digital currency in the event that it becomes more broadly accepted, the results were split. Approximately half (49 percent) were “not at all likely” to use digital currency even if it were widely accepted. Another 18 percent reported that they were “minimally likely” to do so. However, over one-third of respondents combined (34 percent) said they were either likely to use digital currency if it became widely accepted, or were already using it. Breaking down these responses: 13 percent were “moderately likely” to use a digital currency, such as bitcoin; 7 percent were “very likely” to do so; 5 percent were “extremely likely” and 9 percent were already using one. However, Lord cautions that big brands such as PayPal rolling out bitcoin payments integration won’t be enough to inspire widespread adoption. Bitcoin needs more time in the trenches of circulation, he says, and the peer-to-peer networks that maintain the currency will need to further develop Bitcoin protocols (the scripts that execute secure digital currency transactions). 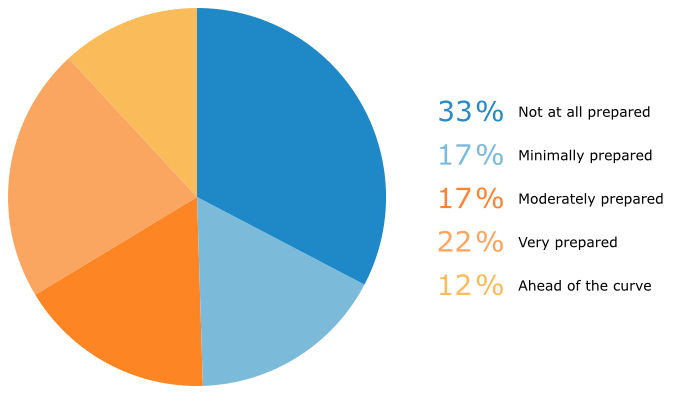 Next, we surveyed SMB employees who identified themselves as being highly involved in, or knowledgeable about, their company’s accounting. These respondents reported levels of readiness that correlated with the above findings from the broader public. 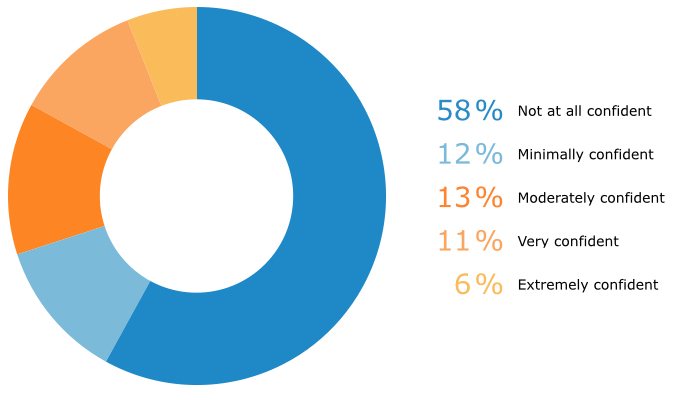 The remaining half indicated some level of readiness for the acceptance of digital payments, with 17 percent being “somewhat prepared,” 22 percent “very prepared” and 12 percent reporting they were “ahead of the curve”—meaning far more prepared than the average business in their field—when it came to accepting digital payments. When asked about accepting digital currency, however, SMBs’ levels of readiness plummeted: 50 percent of employees said their business was “not at all prepared,” while 18 percent said they were only “minimally prepared.” This is not surprising, given the more fringe nature of digital currency. Similar to the 32 percent of consumers who were likely to use digital currency, a combined 32 percent of SMB respondents said their company was prepared to accept and make payments with digital currency. Breaking it down, 13 percent described their business as “somewhat prepared,” 10 percent said it was “very prepared” and 9 percent said it was “ahead of the curve” in terms of preparedness for using digital currency. Companies may be more likely to feel the need to prepare their business if they are exposed to the demand for digital payments and currency on a regular basis, Lord explains. However, Lord predicts that for now, small businesses will continue not to emphasize the adoption of digital currency. “Larger companies like PayPal are leading the charge in terms of digital currency adoption, because they have both a greater impact across the ecosystem and because, in many cases, they can experiment with limited acceptance,” says Lord. While most SMBs may not think they are ready for digital payments and currency, new tools may be removing barriers to entry. According to PayPal, their recent integration with the major bitcoin exchanges (BitPay, Coinbase and GoCoin) means businesses that sell digital goods can sign up for a wallet with one of the aforementioned exchanges, and then simply “turn on” bitcoin payments through PayPal. In terms of the platform itself, PayPal confirms it has not gone through much of a change. But bigger technological developments are afoot with another business unit of eBay and PayPal: Braintree. Paypal recently announced that Braintree’s V.zero SDK—a software development kit (SDK) that developers can use to build mobile-payment platforms—will be able to add Coinbase as a payment option. This means more companies will have the ability to customize bitcoin-ready payment user interfaces (UIs), and this has wide implications. 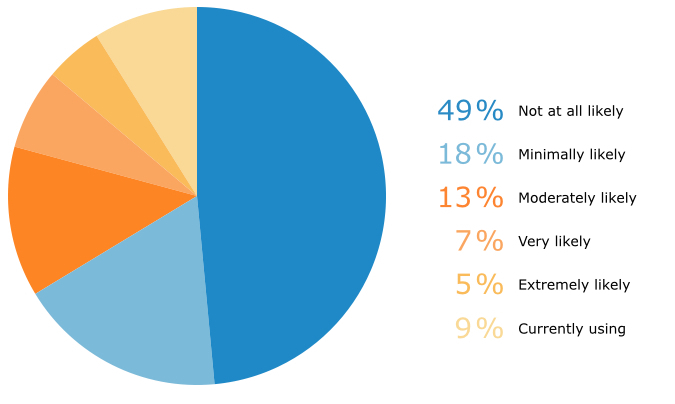 The next area we surveyed respondents on was the day-to-day accounting practices that would potentially be affected by the use of digital currency. We asked whether the business was prepared to create financial reports and file taxes for transactions made using digital currency, as well as to partner with or provide accounting or financial investment services for other companies that make digital currency investments or transactions. We first asked respondents about their SMB’s readiness for tax preparation—that is, whether the business could prepare IRS filings that accounted for digital currency. Here, the majority were still unprepared: The top answer was “not at all prepared” (cited by 39 percent), while another 14 percent were “minimally prepared.” Just 13 percent said they were “somewhat prepared." However, a full 27 percent of SMBs were “very prepared”—a surprisingly large percentage of the sample, and the second most popular response. Finally, only 7 percent reported being “ahead of the curve” when it came to filing taxes based on digital transactions. We next asked about financial reporting, meaning the company’s ability to create financial statements reflective of digital currency transactions and investments. Readiness here was lower than for tax preparation, with the majority being ill-prepared (42 percent “not at all prepared” and 17 percent “minimally prepared”). Seventeen percent were only “somewhat prepared,” while the smallest numbers of respondents were “very prepared” (15 percent) or “ahead of the curve” (9 percent). Finally, we asked respondents whether their SMB was ready to do business with companies that accepted digital currency, either through a partnership or by providing financial services. Here, the results indicated very low readiness: 54 percent said they’d feel “not at all prepared," while 17 percent said they’d feel “minimally prepared.” Smaller numbers claimed to be “somewhat prepared” (13 percent), “very prepared’ (7 percent) or “ahead of the curve” (9 percent) in their ability to work with bitcoin-ready businesses. Of the above, tax preparation readiness seems to be an outlier. Lord said he was “fascinated” by the relatively large number of businesses reporting that they were “very prepared” for tax preparation, noting the contradiction between this number and the lower readiness for digital currency adoption. He says this level of confidence may be due to the fact that the IRS has already issued regulations for 2014 on how to report bitcoin investments. Finally, we decided to take a closer look at SMBs’ confidence in the ability of their accounting software to accommodate digital currency transactions and investments. Here, too, the majority were “not at all confident” in their accounting software’s capacity to handle the use of digital currency. As an alternative, Lazanis points to Libratax, an accounting software with bitcoin functionality targeted at individual bitcoin investors—the vendor of which is currently beta-testing a B2B product. He also mentions a payments protocol with a native digital currency technology built into it: Ripple, which has American and European banks on board. And Lord adds that of the major accounting softwares, Quickbooks is the only one with Bitcoin payments integration: There is an Intuit Labs module for Bitcoin. Lord also notes there are nascent solutions in the payroll software space (e.g., Paybits and Bitwage) that have begun to build Bitcoin integrations for salary and payroll. Assess your clientele. Lazanis says that at networking events for his online accounting firm, he realized many prospective clients were part of the Bitcoin community. “We’re dealing with what I call modern-day business owners. They are in the tech space or the online world,” he says. Deciding to offer bitcoin as a payment method, for his business, was a natural extension of deeply understanding the clients his business wanted to serve. Sign up with an exchange, or get a wallet. Most users currently access digital currency through an exchange: a company that allows you to create a virtual wallet where you deposit cash in exchange for Bitcoin. Lazanis says these emerging exchanges and services can help traditional businesses integrate Bitcoin into their operations, such as CAVIRTEX (Canadian Virtual Exchange), the exchange his Canadian-based accounting firm uses. Decide whether to pay with digital currency. “If it gets to the point where the business [also] wants to pay for things in bitcoin, then it gets very complicated,” says Lord. It is relatively simple to accept payments through exchange firms that deliver the amount to you in dollars—but if you actually pay for, say, office expenses or employee salaries using bitcoin, you have to track both the exchange rate when you received the currency as well as its value when you paid with it. “If you buy one bitcoin at $500 today and buy another one at $600 tomorrow, then the average cost of your coins is now $550 dollars, and that’s going to be the basis for all future gains and losses,” says Lazanis. He recommends that businesses keep a spreadsheet with each Bitcoin transaction that includes the adjusted cost-base (the price at the time of purchase). While major brands are slowly broadening their acceptance of digital payments and currency, SMBs and accounting software vendors still have some steps to take to prepare for these pending changes. The ability of accounting software to keep up with the changing financial landscape, in particular, will be a key element to SMB readiness. To find the data in this report, we collected at least 385 unique responses to two questions posed towards randomly selected adult consumers within the U.S. That gave us a total of 771 consumer respondents. Chart values are rounded to the nearest whole number. 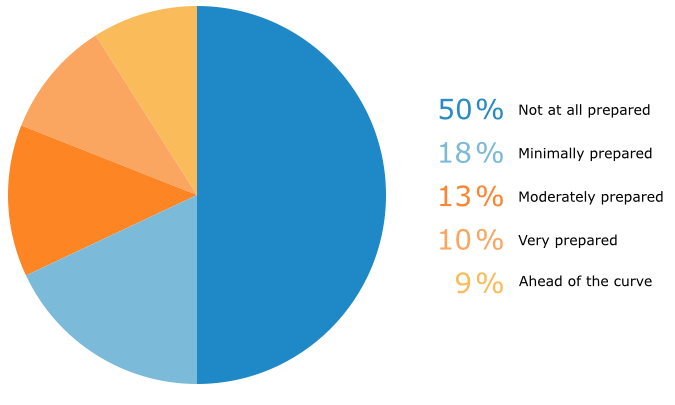 We then collected at least 385 unique responses to six additional questions from people who identified themselves as involved in, or highly knowledgeable about, accounting at their small business (defined as one with $100 million or less in annual revenue), giving us a total of 2,328 SMB responses. We worded the questions to ensure that each respondent fully understood their meaning and the topic at hand. If you have comments or would like to obtain access to any of the charts above, contact noelradley@softwareadvice.com.